Apple&apos;s new MacBook has a 12 inch end to end display. It is sleek, light, and perfect to carry on the go. If you&apos;re an avid traveller, this is the product for you. Compared to other apple laptops, this one has a better battery life. The display is vivid, and despite being small, offers an amazing movie watching experience. You can multitask on the laptop due to the dual screen feature. stylish, sleek, and handy. A business friendly laptop. Not meant for anything more. front camera of 0.3 mega pixels is not good enough. This laptop is something best that could ever happen to laptops. It is expensive but has the best features. Sound quality is so damn perfect. 2. It is very slim. 2. Apple product, so it comes with some restrictions. I bought the laptop last year and it is a good product. Not very powerful compared to the pro though and is a little expensive. Doesn&apos;t have many ports which is a big issue. Not very good for heavy software. A blazing fast laptop from Apple. A sleek design and powerful core specifications enables the user to carry out heavy tasks with ease. The display resolution is razor sharp. 8 Pricebaba users have written their experience with Apple MacBook 2016. If you own Apple MacBook 2016, please do leave your feedback too. Apple’s Macbook is a newly launched fresh lineup of laptops which consists of products which come with good specifications, features and are well-designed too. Alternatively, there are pretty lightweight which makes them very easy to carry. 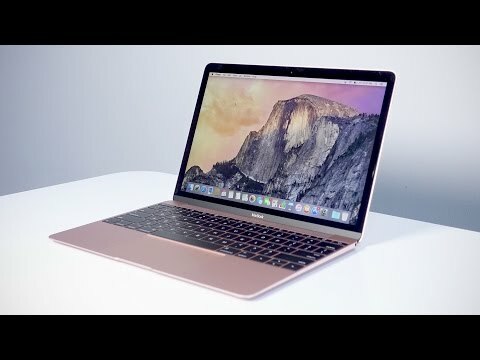 For the first time, Apple launched these laptops in different colours such as Gold, Rose Gold and Space Gray. This Macbook comes with a 12-inch display which has a resolution of 2304 x 1440 pixels. The device has a LED-backlit Display With IPS Technology which makes it easier to view even in daylight conditions. There is a 480p webcam above the display provided for video calling and other utilities. For listening to audio, there are stereo speakers with High Dynamic Range and a headphone + microphone combo jack. On the performance front, the Macbook Pro seems like a powerhouse as it houses an Intel core M3 processor. It has 8GB DDR3 RAM to handle multi-tasking seamlessly but there is just one memory slot provided in the laptop. For storage purposes, the laptop has 256GB SSD storage. Graphic performance is expected to be good in this laptop as it packs in Intel HD Graphics 515. Just like all Apple laptops, this one runs on macOS (Sierra). Since new versions of the operating system has already been launched, you can upgrade the laptop. On the connectivity front, there is one USB Type-C port provided which acts as a multi-port for all purposes. Bluetooth v4.0 and Wi-Fi IEEE 802.11a/c/g/n are provided in the laptop as well. You get a 76 WHr battery which will provide a battery life of 10 hours. Dimensions of the laptop is 11.04 x 7.74 x 0.14 and the laptop is quite lightweight at around 0.92kg.